Global automotive electronics market expected to reach USD 9, 507 million by 2024, growing at a CAGR of around 8.14% between 2018 and 2024. The recent shift of the automobile industry toward the systems offering luxury and comfort is a primary factor fueling the automotive electronics market. The report analyzes and estimates automotive electronics market on a global and regional level. The report offers past data for 2015, 2016, and 2017 along with the prediction from 2018 to 2024 based on revenue (USD Million). 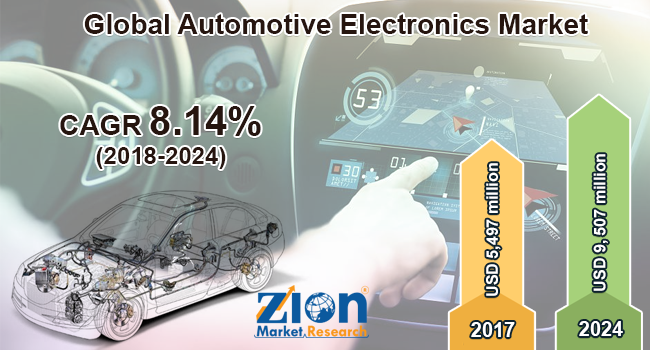 The study also offers a brief thought about the drivers and restraints for the automotive electronics market with the effect they have on the demand over the estimated period. Furthermore, the report includes the study of opportunities available in the automotive electronics market on a global level. The report gives transparent views of the automotive electronics market. We have included a detailed competitive situation and portfolio of leading vendors that are operating in the automotive electronics market. To understand the competitive state in the automotive electronics market, an analysis of Porter’s Five Forces model for the automotive electronics market has also been covered. The study also offers a market attractiveness analysis, in which application and regional segments are marked based on their growth rate, market size, and general attractiveness for the automotive electronics market. The report provides company market share analysis in order to give a broader overview of the key players in the market. In addition, the report also covers key strategic developments of the market including acquisitions & mergers, new product launches, agreements, partnerships, collaborations & joint ventures, research & development, product, and expansion of major participants involved in the market on a regional basis. The study provides a crucial view on the automotive electronics by segmenting the market based on application and region. All the application segments of the automotive electronics market have been analyzed based on present and future trends and the market is estimated from 2018 to 2024. ADAS, powertrain, safety system, infotainment, and body electronics are the applications segment for the automotive electronics market. The regional segmentation comprises the current and forecast demand for the Middle East and Africa, North America, Europe, Latin America, and the Asia Pacific with its further classification into the U.S., the UK, France, Germany, India, China, Japan, and Brazil for the automotive electronics market. The competitive profiling of key players of automotive electronics market includes the company and financial overviews, business strategies adopted by them and their recent developments, and products offered by them which can help in assessing competition in the market. The key players included in the report are Yamaha Corporation, Sanyo Electric Co., Ltd., Philips N.V., Bosch, TRW, Johnson Controls, Denso Corporation, Sony Corporation, Continental AG, and Delphi Automotive PLC, among others.